A ticalc.org meet up is not entirely unknown, but on October 18th, 2009, 5 of the individual staff members currently listed as "current" meet up for much discussion and rejoicing in Seattle, Washington. While we would like to take credit for arranging this meet up far in advance, it actually seems that four of us actually live within 15 miles of each other and never actually realized this fact until approximately 48 hours ago. In proof that twitter can be useful on occasion, our illustrious Reviews Editor noticed that the Editor-In-Chief would be in town for a SQL conference. Quickly seizing the initiative and realizing that there were quite a lot of us already in the Seattle area, a meeting was arranged. After discussion regarding all sorts of extremely relevant topics (including a proposal to declare Seattle as "calculator capital of the world") and consumption of various amounts of beer, we parted company and returned back to our lives. However, despite the best efforts of Magnus, a picture was taken as proof of our amazing planning skills. Additional meetings in the future may be on the agenda! 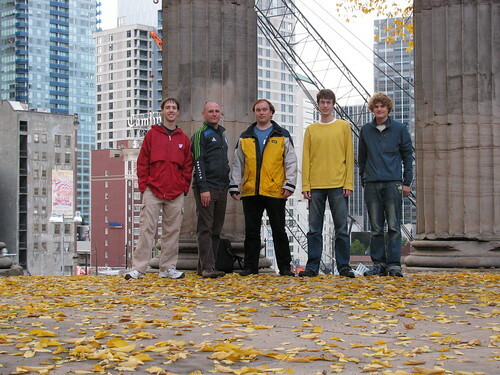 From Left to Right: Jason Malinowski, Isaac Salpeter, Magnus Hagander, Duncan Smith, and Nikky Southerland. Note how that it was actually not raining. It most certainly was in Seattle. Oh don't worry, it was definitely still Seattle. My drive home on the highways probably averaged 30 MPH. And I'm pretty sure it rained early this morning. Right, 'capitols' are buildings while 'capitals' are cities. Often times capitols are in capitals. ehh, same difference. English is too confusing even if it's my only language. The alternate text for the photo is great.